Andrew Nembhard is currently captaining the Canadian team at the FIBA U18 Americas tournament in St. Catharines, Ont., and will be heading to the University of Florida in the fall. But none of this seemed possible after an illness last year forced Nembhard to the sidelines. In the last eight months, Canada's Andrew Nembhard has won a U.S. national high school basketball championship and committed to one of the premier college basketball programs in the University of Florida. Now, the 18-year-old is captaining an undefeated junior national squad heading into its quarter-final match Thursday night at the FIBA U18 Americas tournament in St.Catharines, Ont. It's almost unthinkable, considering the way Nembhard's junior season at Montverde Academy in Florida came to an abrupt halt in March 2017. After grabbing a slice of pizza close to his high school, it didn't take long for the Aurora, Ont., native to realize that something was wrong — his stomach wasn't feeling right. Nembhard began vomiting continuously and was taken to hospital, where surgery revealed that he was suffering from volvulus — a condition in which a loop of intestine twists around itself, resulting in a blockage that keeps food or liquids from passing through and a loss of blood flow to the area. Nembhard was later transferred to Sick Kids hospital in Toronto, where he spent three weeks recovering. The harrowing experience wasn't lost on him as he took the court this week. "I'm just blessed and honoured to play for the country. It's a great opportunity for everybody on the team, so I'm just happy to be here," Nembhard said after Canada's 92-75 opening win over Argentina. The six-foot-four guard credits his inner circle and keeping an optimistic mindset for getting him back on the court sooner than expected. 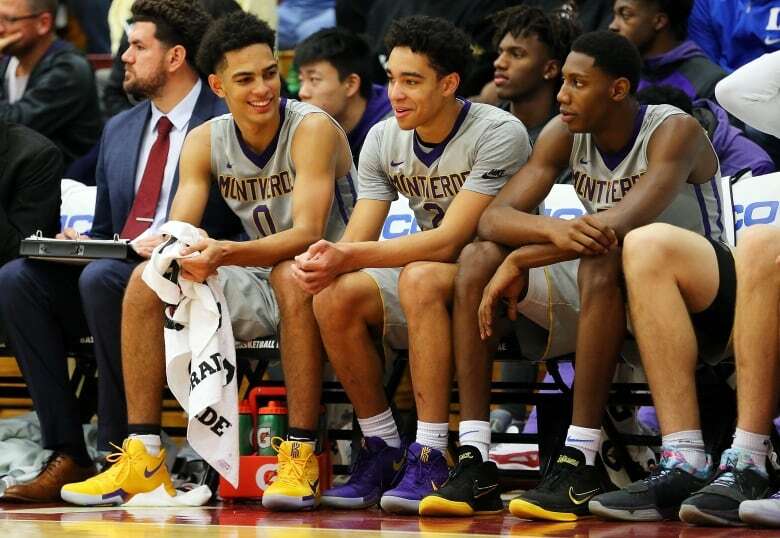 There were doubts that Nembhard would even play in his senior season, let alone help fellow Canadian phenom R.J. Barrett lead Montverde to a U.S. national championship. Some college teams that previously had interest in Nembhard stopped contacting him when they heard of his illness. But Nembhard wasn't worried much about that — his priority was himself and persevering through his illness. "I had a great supporting cast around me — my family, friends, a lot of coaches — that helped support me throughout my journey. My dad was really positive throughout the whole situation," Nembhard recalls. "In our heads, we were always thinking I was going to be back on the court next week … I feel like being positive and knowing that I was going to get back to where I was, was the best thing for me." The road back started with his trainers. Nembhard had lost 21 pounds, so he needed to re-gain that weight plus build strength. While he wasn't starting from scratch and re-learning basketball, it took some time for Nembhard to became accustomed once again to the flow of the game. After helping Canada claim silver at the 2015 FIBA U16 Americas and to a fifth-place finish at the 2016 FIBA U17 worlds, it was a bittersweet moment for Nembhard to see the program reach new heights in his absence after its historic gold-medal performance at last year's FIBA U19 Basketball World Cup. He wanted to be in the mix and had been in previous camps with many members of that championship squad as they rose through the ranks. But if there was a silver lining, it's that Nembhard feels better prepared for the challenge of his present role because of it. "It was good to watch those guys and then try to become a leader this year to help this team … it definitely built character and makes me cherish and attack everything in a more mature way," Nembhard says. In the past, Nembhard mostly let his play do the talking, leading his teammates by example. But Canadian head coach Dave Smart challenged his starting point guard to be more vocal and Nembhard has responded from the get-go of the tournament. In Canada's opening game, a sequence saw Nembhard pointing and verbally communicating a defensive assignment to his teammate Jahcobi Neath. When his fellow guard failed to take the proper position, Nembhard grabbed the back of Neath's jersey and pushed him toward the spot on the floor where he wanted him to be. If it wasn't clear already, this is Nembhard's team and he's relishing the opportunity to guide his teammates and country to a championship on home soil. "I'm looking to get a gold medal out of this week. I'm looking to help motivate the team as captain — lead and push everybody," Nembhard says. "I think this tournament will prepare me really well [for Florida] because I'm a leader on this team — I have to try and make plays for the guys."